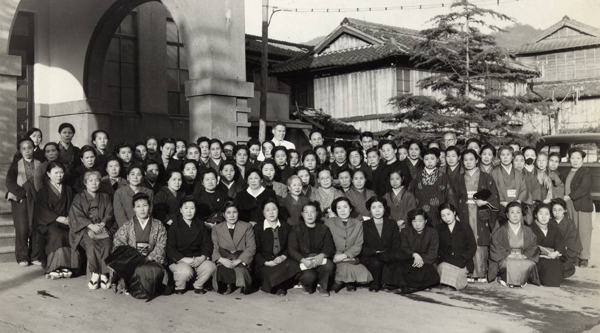 Nagasaki midwives meeting with Atomic Bomb Casuality Commission doctors. Seventy thousand new born children were examined in Hiroshima and Nagasaki. In Nagasaki, 500-800 babies were examined in their homes. No evidence of genetic injuries have been detected. Today in 2008, with newer modalities to study genetic injury become available the blood samples 500 of the most heavily radiated individuals Nagasaki and controls are immortalized--preserved and available for future studies to detect injury. Further assessment of the children born to the surviors of the atomic bomb are being assessed. To date, no clear cut evidence of genetic injury have been found in children born to survivors of the atomic bomb. A recognized caveat from the onset of the study is that the amount of radiation incurred by the survivors is about one tenth of the lethal dose. All plants and animals studied have revealed radiation mutation effects. Still, scientists must be concerned about the interlinked yet unknown effects of radiation mutation on the human/plant/animal chain in our global future.